The forthcoming NIST’s Advanced Hash Standard (AHS) competition to select SHA-3 hash function requires that each candidate hash function submission must have at least one construction to support FIPS 198 HMAC application. As part of its evaluation, NIST is aiming to select either a candidate hash function which is more resistant to known side channel attacks (SCA) when plugged into HMAC, or that has an alternative MAC mode which is more resistant to known SCA than the other submitted alternatives. 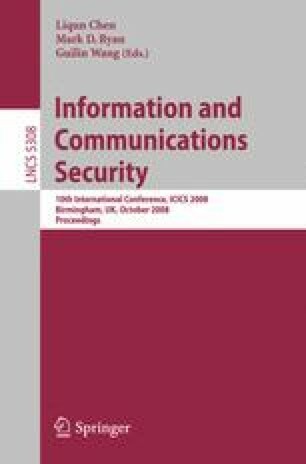 In response to this, we perform differential power analysis (DPA) on the possible smart card implementations of some of the recently proposed MAC alternatives to NMAC (a fully analyzed variant of HMAC) and HMAC algorithms and NMAC/HMAC versions of some recently proposed hash and compression function modes. We show that the recently proposed BNMAC and KMDP MAC schemes are even weaker than NMAC/HMAC against the DPA attacks, whereas multi-lane NMAC, EMD MAC and the keyed wide-pipe hash have similar security to NMAC against the DPA attacks. Our DPA attacks do not work on the NMAC setting of MDC-2, Grindahl and MAME compression functions.